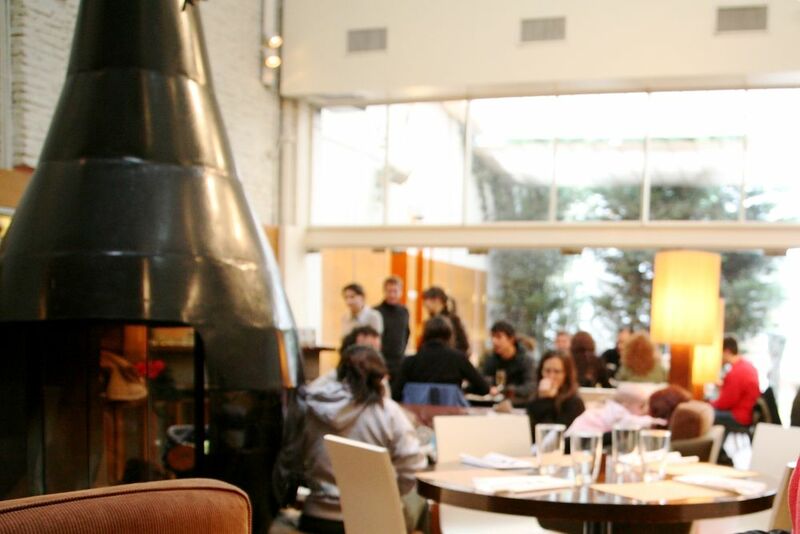 Our guidebooks, as well as just about every other piece of Buenos Aires literature, had suggested visiting Olsen for Sunday Brunch. Sunday Brunch doesn't seem to be much of a BA thing as, from what I can tell, it's usually only the major hotel chains that have European/American breakfasts. So, this idea sort of intrigued me. Even more, Olsen purportedly puts a Norwegian twist on everything. While the minimalist decor and trend-following clientele was certainly a sight, the food was not up to match. 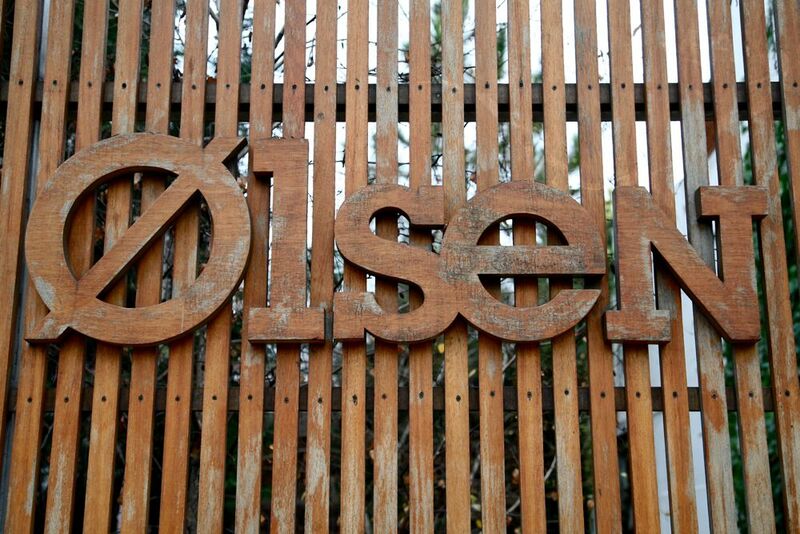 We got out of our taxi to the entrance of the restaurant, a tall wooden fence with embossed lettering that spelled Olsen (note the "Scandinavian" O in the image). After being briefly embarrassed that I could not find the entrance, I noticed an intercom system which I assumed was the first step to admittance. So I pressed it; I was right. I was asked if I had a reservation; I did not. I was put on hold for a minute without notice until the hostess began to walk to the entrance. She informed us that reservations were necessary and that the restaurant was very busy, especially since this was Sunday brunch. There was an awkward pause after this where we weren't sure if she was telling us we had to come back, or if we should just make reservations in the future. After about 20 seconds of stares, we were told that we were lucky and could be seated. Nice! 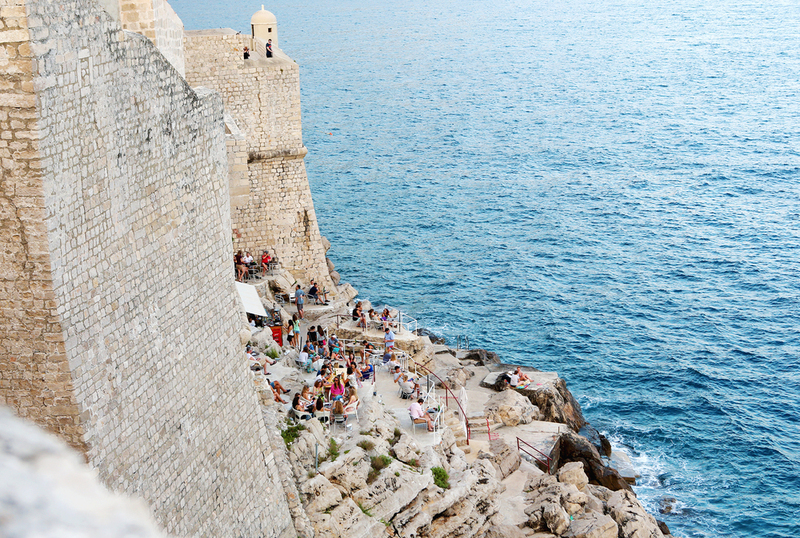 We entered the gates and walked through the fairly large courtyard en route to the restaurant. While it was a bit chilly to want to sit outside, this seemed like a nice place to have a drink or afternoon coffee during warmer weather. The facade of the restaurant was entirely of glass which let in an enormous amount of natural light. As is typical with Scandinavian architecture, the differentiation between inside and outside was very loosely defined. It was drizzling outside and, although inside, at times I felt like I should have been getting wet! The restaurant consisted mostly of natural woods and concrete. In the middle of the restaurant sits a cast-iron pot-belly fireplace that was burning. This seemed to be the best table in the restaurant so, if you're with a party of two, I'd recommend requesting it. After settling down, we were promptly shown the specialty drinks menu with specialized vodka section. Some of the drink concoctions looked really nice, especially the ones involving champagne. Olsen also boasts an extensive collection of frozen vodkas; but, it was a little early for us to start with that. Our menus came in the form of placements and I opted for for the $39 option (13 U$D) which essentially included a drink, a plate of appetizers, a main course, dessert, and coffee. We placed our orders and were brought a selection of house-made bagels stacked vertically on a ring. I regret not having taken a picture of this as it was the highlight of the meal. There were 3 flavors of bagels: white, whole wheat, and rye. To accompany the bagels came fresh strawberry and grape jam. I asked for butter, which was brought just after I was told that "Olsen doesn't use butter in its dishes." These bagels were thin with a texture very similar to that of Auntie Anne's original pretzels, and they were served warm. A little butter and salt, and I was very happy. The meal was pretty much downhill from here. My plate of assorted appetizers came which included 5 canapés. I asked the waiter for a brief description of what each one was and I was told, "cucumber, cheese, meat, another kind of meat, and fish." When I asked what kinds of meats, cheeses, and fish, the waiter had already run off to another table. The canapés seemed to be: manchego cheese with brown pear, cucumber and fish roe, roast beef with green pepper, mayonnaise, and grape jam, tuna with mayonnaise, and shrimp salad. Aside from the tuna, which I don't believe is a fish abundant in Scandinavia, none of these canapés seemed particularly The bread was hard, dry, and cold, as was the plate. It was clear that this plate had been sitting in the refrigerator awaiting service. I sampled a bite of each and had no need to finish which for me, is not a good sign. 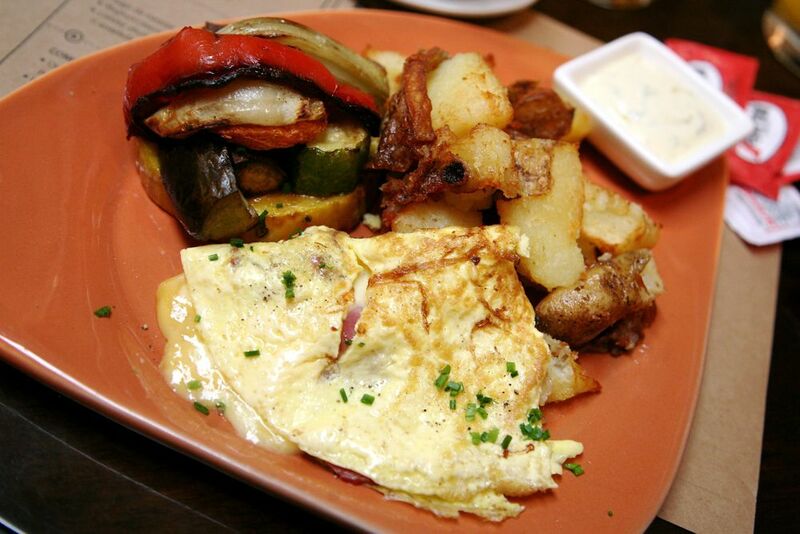 Next came the main course where I ordered a ham and cheese omelet, crushed potatoes, and grilled vegetables. Not sure where the Scandinavian influence was for this dish, nor any other dishes on the menu for that matter. Everything was really oily (maybe that's why they had no use for butter) and over salted. Just when I thought there might not be mayonnaise, it was brought out by the waiter with apologies moments after setting down the plate. Was that what made this dish Scandinavian? Dessert consisted of a fruit trifle with spongecake. This definitely the best out of the three courses (excluding the house bread); but there was way too much spongecake sucking up any last drops of moisture. I found myself dipping bites of the trifle into the strawberry jam left on the table from the bread. The tangy flavors of the berries were overwhelmed by the abundance of whipped cream and sponge. The check came, and Sunday brunch came to $15 / person. I'd recommend saving Olsen for a warm sunny day when you can stop by for afternoon coffee while shopping in the area, or on a nice evening for drinks. But I would certainly not make Olsen a destination spot, even for Sunday brunch.